I’m not the biggest fan of fennel. However, it makes for a beautiful display in the herb garden. Its early stages appear feathery like a young dill plant. 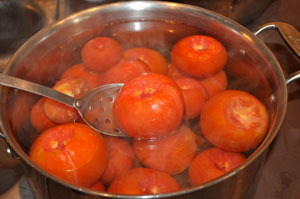 Later in the summer, the thickened stalks become tinged in a copper color and it shoots upwards in excess of five feet. The seed heads are numerous and bursting with fennel seeds right now—the perfect time to chop them off to stop them from spreading!! 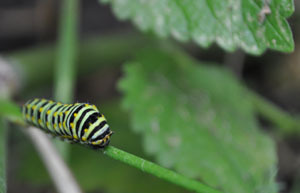 So there I was whacking away at the stalks, when I spotted this beautiful caterpillar balanced on a lower stem. I paused, momentarily, because the stripes were so unique. When I spotted the second one on the stalks, I put down my clippers. What was the connection between these caterpillars and this fennel plant? 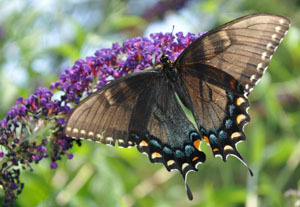 After some online research, I learned adult butterflies feed on nectar plants while caterpillars feed on host plants. 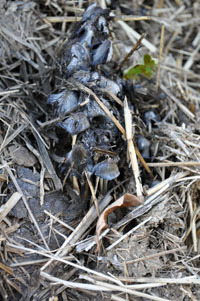 Those host plants are singled out by individual species for their ability to feed and nurture a caterpillar. Some butterflies are so picky, there is only one host plant upon which they lay their eggs and feed (such as the Monarch’s relationship with milkweed plants). 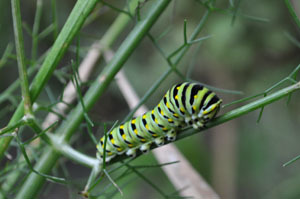 The caterpillars on the fennel plant are Eastern Black Swallowtails and feed on fennel, parsley, carrot, and dill. Wow. What a delicate balance?! I took this picture of a Black Swallowtail in my flower garden two months ago—not realizing how beneficial it would be to have a fennel plant a mere 20 feet away. I think I can learn to love fennel again—because I sure love these butterflies.